I have reviewed a couple of Minimax machines recently and continue to be impressed with their build quality, so was keen to have a good look at another, this time the SC4 Elite panel saw. 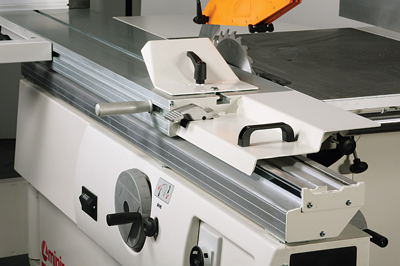 Its heritage is unrivalled as Minimax are part of the SCM group of companies who have been specialising in top-end woodworking machinery for over 50 years. They manufacture everything from small workshop machines like this one, up to factory sized CNC pieces of kit, and the proud boast is that it is all still made in Italy, which allows them to maintain a consistent standard of quality. They continue to thrive as a company because the machines are constantly being updated to keep pace with new technology and safety requirements, so as well as being top quality they also look stylish and modern. 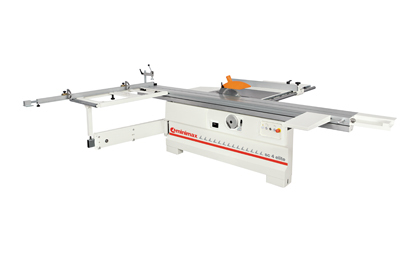 The SC4 Elite panel saw is squarely aimed at the small professional user with the emphasis on precision and practicality at a cost-effective price. 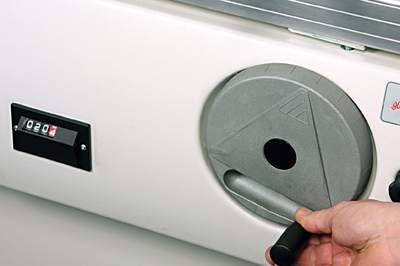 The machine is available in several variations that you can customise to suit your own particular requirements. For instance, there are four options for beam length and several motor variations in both single and three-phase. The first impression of this machine is one of solidity. There is a lot of heavy metal in it and the build quality and finish is excellent with none of the sharp corners and 'iffy' castings of cheaper alternatives. The main cast iron section of the table is 840 x 560mm, but the steel extension table adds a further 940mm to the width so there is plenty of support for big panels. I was particularly impressed to see that this extension was perfectly flush with the main table, so there was none of that frustrating need to lift the fence over the join when you slide it across. The cast table has a characteristically ridged ground surface rather than a highly polished surface. Over the years I have heard all the arguments for and against both styles, but to be honest I am not convinced that one is better than another. As long as it's flat, I'm happy, and there were no problems with that on this particular machine. The rip fence is excellent, one of the best I have used, mainly because it is so simple. So many manufacturers seem to go out of their way to make the rip fence unnecessarily complicated. It just needs to be big and strong with a quick and easy lock and a simple fine adjuster. This one scores on all fronts having a massive cast iron support running on a polished bar, but it moves effortlessly. The fine adjuster only requires a push down and twist to engage a rack and pinion to allow minute adjustments; 10 out of 10! 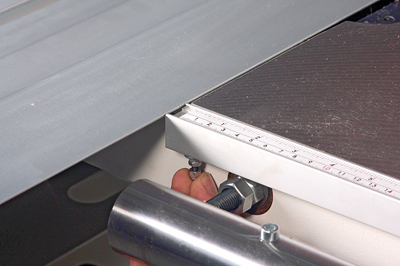 What's more, the scale is adjustable as well, so it can be calibrated quickly to suit the blade being used. to operate, or rotate offcentre, this one is a pleasure to use and it's on the front, not tucked away on the side which always confuses me. The adjustments for the scoring blade can also be made from the front with two separate knobs for rise and fall and side to side movement, so again, it's dead easy and no fiddly Allen keys operating through the table into blocked up screw heads! The standard blade is a coarse 24-tooth which rips very cleanly but is far too coarse for panel work, so you will have to invest in a suitable triple chip alternative. 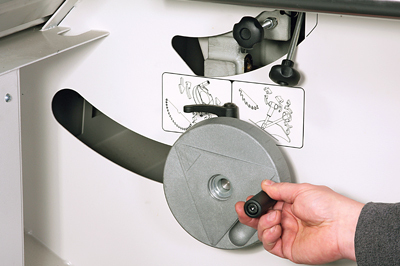 Blade change is easy, just pull the beam back to get direct access to the locking nut. The blade tilts up to 45° via another decent handwheel and you get an instant digital readout of the angle on a neat little scale. What I also liked was the positive stops at 45° and back at 90°, they give you confidence that the blade is actually where it is supposed to be, without the need to check and fiddle about resetting it with a square. You still get a hefty 70mm depth of cut at 45°. The sliding beam is made of extruded aluminium enclosing a honeycomb structure for strength and rigidity and it slides on a unique hardened steel guide and bearing system that SCM have developed over many years. This means it runs very smoothly and quietly, without a trace of play and the enclosed self-cleaning dustproof enclosure is claimed to ensure lifelong accuracy with no need for further adjustment. Very impressive. The beam locks firmly with a very accessible catch and you are also provided with an edging support for waney edged boards and a material clamp. I tested the 1,600 stroke length beam but there are longer versions up to 3,260mm. The squaring frame is an impressive 1,200 x 650mm, so again, you get plenty of support for panels. The fence can be fitted to either the front or the back of the table and is adjustable for angles as well. It is also very quick to remove if you want it out of the way, you just have to unscrew two large knobs and it lifts off. The fence bar is telescopic and can extend out to support long workpieces. Another nice touch on the Minimax SC4 panel saw is the roller in the end of the frame which helps you load on large panels, a real help if you work on your own. Two flip over stops make it easy to repeat cuts and another quick release lever clamp can be engaged to hold the workpiece secure on the frame. 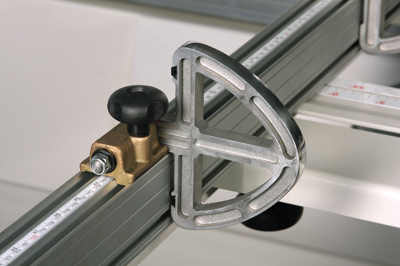 This whole frame is supported on a very substantial telescopic swinging arm that folds flat against the side of the machine if you want to remove the squaring frame to make some space. 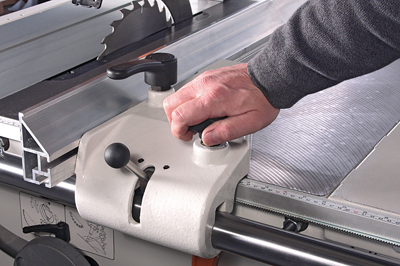 As you would expect from all this, the saw is a real pleasure to use, the motor has plenty of power to cope with deep ripping cuts and the effortless movement of the squaring table coupled to the fine cut of the scoring blade ensures absolute precision for panel work with a perfect cut on both faces. 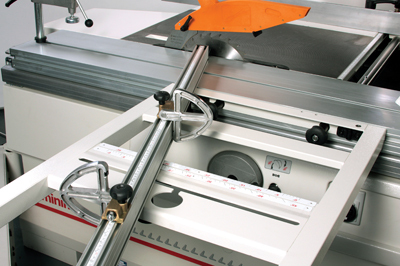 You will, however, get a massive power boost by moving up to one of the three-phase models which might be significant if you do a lot of deep cutting, but is less so for panel cutting. Although the Minimax range is classed as budget it is still pretty expensive machinery. However, if you factor in the build quality compared to less well-engineered machines then it is actually excellent value for money. Everything works as it should straight out of the box, making it a pleasure to use and it will last forever. I just wish I had the space or use for one; you have to love that rip fence! Molto buono, eccellente! Dust extraction outlets: 120mm dia.